WebForMDs.com | Healthcare Business Solutions | Why Use WebForMDs.com? Evaluations & Patient Signout: Why use WebForMDs.com Technologies? Residency Evaluation System, Patient SignOut PRO, and other WebForMDs.com products are designed to help large scale health care programs and organizations comply with ACGME requirements. These systems not only help you meet or exceed new requirements, but online tools and report analytics provides meaningful statistics that real-time data into actionable information. A program director may view evaluations a few seconds after an evaluation is complete by an attending or a resident. Patient SignOut PRO allows residents to track patients and sign out patients to one another via the internet thereby reducing paperwork while improving patient care. 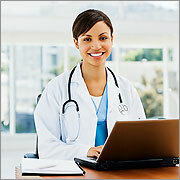 This HIPAA compliant service is monitored and the data is kept on a secure server. Multi-tiered security measures including electronic and physical security options ensure that all patient data is kept as safe and sound as you keep your own patients. With WebForMDs, you can be sure that your data is kept secure. For more information, call (888) 200-0080 and contact WebForMDs.com for more detailed information.